Prof. Dr. B.K.N. Rao was born in Bengaluru (in India) in 1934. He gained his B.Sc in Physics, chemistry and Mathematics from the University of Mysore; Post graduate Diploma of the Indian Institute of Science (DIISc) in Industrial Administration; M.Sc in Environmental and Human Factors in Engineering from the University of Southampton; PhD in Mechanical Engineering from the University of Birmingham. In 2004, he was awarded the Higher Doctorate in Technology (DTech) from the Sunderland University for “his significant, sustained and distinguished contribution in the field of Condition Monitoring”. He was a Chartered (CEng) and European Engineer (Eur Ing) in the field of Measurement and Control. He is a UK Member of IMEKO Technical Committee TC10 (Technical Diagnostics). In October 2016 he was awarded the Honorary Fellowship of the Condition Monitoring Society of India. He worked at the Electronics and Radar Development Establishment (LRDE) in Bangalore. He immigrated to UK in 1966 and worked as a Packaging Design and Development Engineer in a private company. He worked as a Research Fellow in Environmental Acoustics at the University College London and a Post Doctoral Research Fellow in Automobile Engineering and Tribology at the University of Birmingham. He joined as a Senior Lecturer in Dynamics and Control at the Birmingham Polytechnic (now named Birmingham City University) and developed and pioneered various condition monitoring programmes. He continued his mission as a Principal Lecturer and a researcher at the Southampton Institute of Higher Education (now named Southampton Solent University) and was promoted as a Reader and Professor of Condition Monitoring Technology. He supervised and examined a number of Master’s and Doctoral programmes in the multidisciplinary field of condition monitoring technology (from UK, India, Canada, Republic of South Africa, Sweden) and has published in excess of 150 original papers in many scientific and engineering journals. He is the author and Editor of the Handbook of Condition Monitoring published by the Elsevier. He authored and edited a number of books, Handbooks and International Conference Proceedings in the fields of Condition Monitoring, Human Response to Vibration, Maintenance Management. He is an External Lecturer and a Visiting Professor at a number of UK, European and Indian universities. He was a Member of the British Standards Institute’s Working Group on Condition Monitoring and Diagnostics of Machinery. He was invited to the Editorial Board of the Journal of the Institute of Measurement & Control, the Journal of British Institute of NDT, the International Journal of Condition Monitoring and Diagnostic Technology and many other international journals. 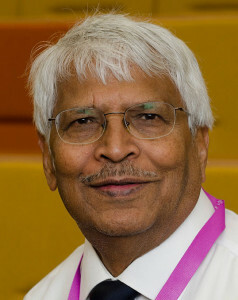 He pioneered the concept of Condition Monitoring and Diagnostic Engineering Management (COMADEM) in 1988 and has been successfully organising annual international congresses and exhibitions in UK, France, India, Canada, Finland, Australia, USA, Sweden, Czech Republic, Portugal, Spain, Japan, Norway, Argentina and PRC. He has co-edited 30 international COMADEM congress proceedings which have been published by major publishing organisations. He is an invited Editorial Member of the Journal of Diagnostika, Poland. He is the Editor-in-Chief and Publisher of The International Journal of COMADEM. He was invited as a Keynote Speaker at a number of International Conferences. He was recently invited to deliver the First Dr. V. Bhujanga Rao Endowment Lecture organized by the Condition Monitoring Society of India and GITAM University based in Vishakapatnam. He was nominated as the Best Researcher of the Year. His name is cited in Marquis’s Who’s Who in Science & Engineering, USA; International Biographical Centre, Cambridge; International Profiles of Accomplished Leaders, USA; International Dictionary of Professionals, USA. He is the Sole Proprietor/Director of COMADEM International, UK.